This week we celebrate the birth of two influential artists born 47 years apart. Georgia O’Keeffe (November 15, 1887), the mother of American modernism, and Claude Monet (November 14, 1840), one of the founders of French Impressionist painting, may have practiced different styles, but both shared a love of nature, as can be seen in the vast majority of their paintings. Flowers, in particular, seemed to capture their imaginations! Stop to smell the roses and help us celebrate these renowned artists by visiting their works for FREE in the DMA’s collection galleries sometime this week! For next week’s Second Thursdays with a Twist, we’re celebrating the powerful women who made waves in the art world with Who Run the World? Even though the night will focus on female artists in our collection, we are adding some Beyoncé and other strong women into the night as well. While we love highlighting artists from our collection, like Georgia O’Keeffe, Frida Kahlo, and Mary Cassatt, we thought for a night like this we would show off other amazing artists that you might not know that much about. Anne Vallayer-Coster was born into an artistic family; her mother made miniatures and her father was a goldsmith to many wealthy patrons. When she was 26 years old, she was unanimously voted into the Académie Royale in Paris. This was an enormous accomplishment because they only allowed four women in at a time. In 1780 she was named as the portrait painter for Marie Antoinette and became very popular in the court; she was known to be a confidant to the queen. 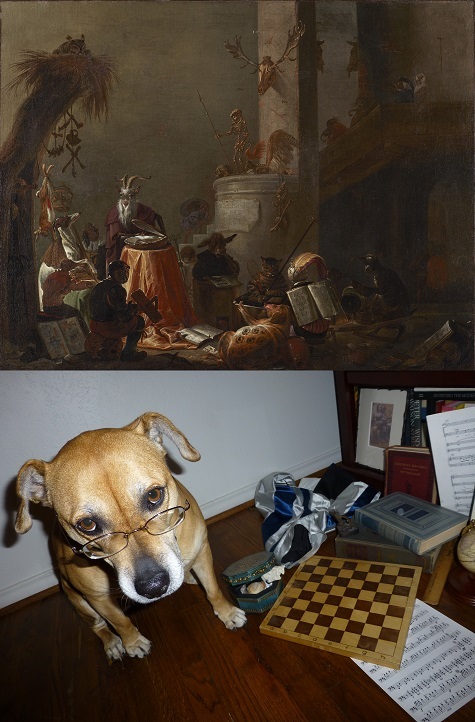 In the period leading up to the French Revolution, she was critiqued harshly after an exhibition and from that point forward only painted still lifes. 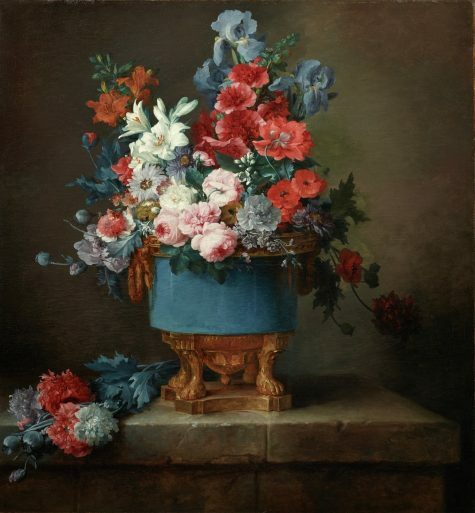 She mastered decadent bouquets and created beautiful, detailed works like those in the DMA’s collection. Alice Kent Stoddard focused mainly on portraits, landscapes, and seascapes. 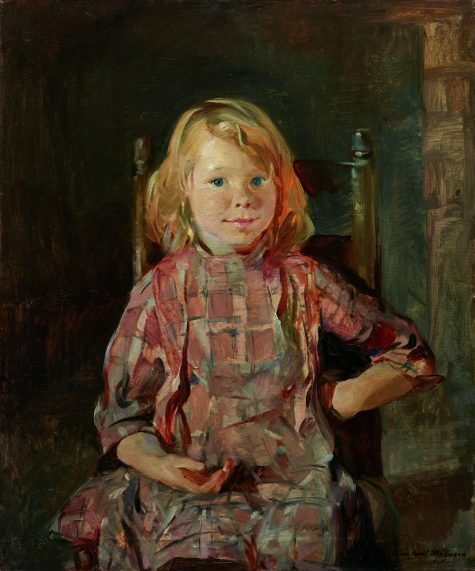 Stoddard studied at the Philadelphia School of Design for Women, after which she studied under William Merritt Chase and Thomas Eakins at the Pennsylvania Academy of the Fine Arts. She was a member of the Plastic Club, which was the first all-women’s art group in the United States. During World War I, Stoddard depicted the US regiments and French refugees to garner support for the war effort back in the states. That wasn’t the end of her wartime career: during World War II, she continued to serve her country the best way she could. She began working as a mechanical draftsperson for the Budd Company, a leading manufacturer of airplanes. Stoddard also served as a combat painter on the European front. She was one of the most prominent portrait painters of her time and was the first female artist to be named in Who’s Who in American Art. Henrietta Shore was born in Canada and had an early interest in art. She also had a deep connection with nature, which ended up being the focus of her work. Shore moved to New York in her twenties to continue her studies in painting under Robert Henri. She eventually moved to California and painted in an artist colony in Carmel. She was able to sell paintings and gained acclaim while there, but she became increasingly frustrated with critics. They would try to connect her sexuality with her abstracted paintings of nature, even though she had not intended those connections. She said that she painted a semi-abstracted “life rhythm” and did not want to be placed in any “school” or “ism.” She did not want to be defined. Her masterful simplification of natural forms makes her one of the best artists of her time that you have probably never heard of. If you want to know more about these and other amazing artists in our collection, come out to Second Thursdays with a Twist on November 9 from 5:00 to 9:00 p.m. You can find the full schedule of events here. Katie Cooke is Manager of Adult Programming at the DMA. Last year the DMA pets took to the catwalk for Dress Your Pet Up Day, which is held every January 14. We had such a paws-itive response that we couldn’t wait to get our fashion hounds ready for their close ups once again. DMA staff and their furry pals took inspiration from the DMA’s collection and delivered some on trend looks that will get your tails WAGging. 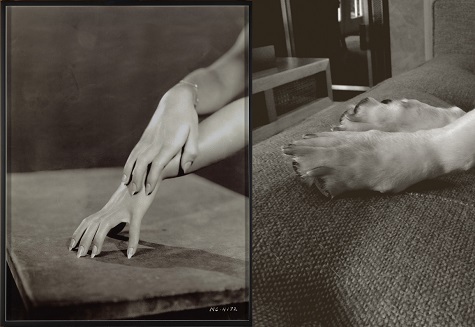 I’ve always been fascinated with Sabby’s short little legs and big paws, and when I saw the Pascual photo I knew we had to re-create this artistic still life. However, due to her short/long stature, a lounging pose was required! 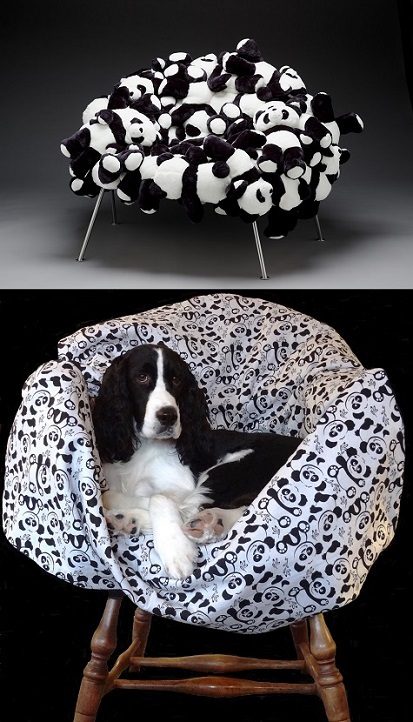 With Parker being a black-and-white Springer, my mind went immediately to the banquete chair with pandas in our collection. Since it was cost prohibitive to buy a lot of stuffed pandas to place around Parker in a chair shape, my mom made a panda bear quilt with fabric we found online, which we then draped over a chair before posing Parker in it. Dress Your Pet Up Day provided George with the perfect excuse to invite Chloe over for a play date. Even though he is a rough and tumble type of dog, he knows when to bring on the charm and put his best paw forward like Woodbury. (While George has many talents, holding a westie stamped document isn’t one of them. Amanda created a lifelike paw for his shoot). 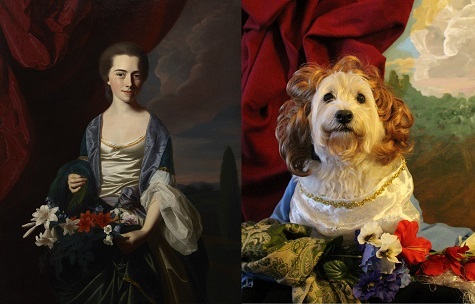 Chloe and George have been discussing portrait options since last January to create a team for this year’s Dress Your Pet Up Day. 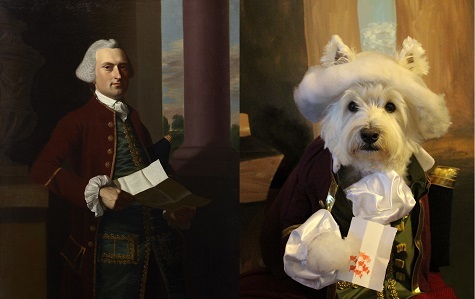 The perfect pair for this westie duo were the Langdons, though George took to his sophisticated background much more easily than Chloe. She hasn’t adjusted to the nouveau riche lifestyle of the Langdons. A cat can be a difficult model. Since I am the objects conservator here at the DMA, I wanted to choose one of the many fabulous sculptures from the collection that are currently on view. The Nandi bull, the bull that serves as mount and gatekeeper for the god Shiva, was an obvious choice by my dear Captain for several reasons: reclining, an “immature” bull, a protector, and adored by many. He didn’t really want to wear the floral garland trim and thought it was something to play with. His usual “reclining” pose went out the door. Georgia O’Keeffe is one of my daughter’s favorite artists and Grey Blue & Black – Pink Circle is my favorite O’Keeffe in the Museum’s collection. My original idea was to attach colored fabric to my dogs’ harnesses and capture them running in circles; however, Nene did not want to participate, so I was left with one Chihuahua who didn’t want to run around solo. So I improvised. I set the camera for a longer exposure setting, stood above Fidel, and twisted the camera as I took my photograph, blurring the colors around him. Baxter has always looked like an old man, even as a puppy. He captures the feeling of this painting very well, but he would not cooperate and wear a beard. Sampson adores boxes and loves to hang out inside them. 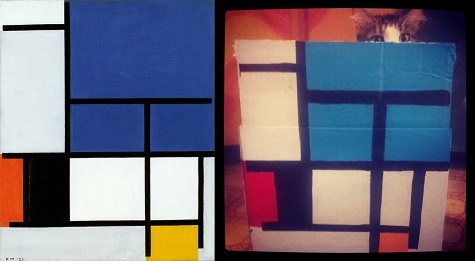 When I saw Mondrian’s piece Composition with Large Blue Plane, Red, Black, Yellow, and Gray, I just knew Sampson would love to participate in the work by transforming the flat 2D plane of the work into a 3D box of De Stijl art! Sampson is mostly white and black and gray with pops of color, like the ginger in his fur or the green in his eyes, similar (but not exactly) to Mondrian’s pieces during the De Stijl movement that focused on the use of primary colors and cubist influence. 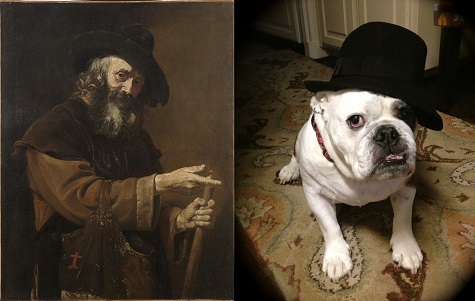 Mondrian believed that “all things are parts of a whole,” and Sampson definitely completes my existence. Mosey was inspired by her four-legged scholar friends in the College of Animals to brush up on her humanities in order to be a well-rounded canine companion. The cat (not pictured despite many attempts) claimed that she knew all that was worth knowing in life and much preferred napping to studying, thank you very much. I wanted to play upon the animals’ color, as all three are entirely, or almost entirely, black. 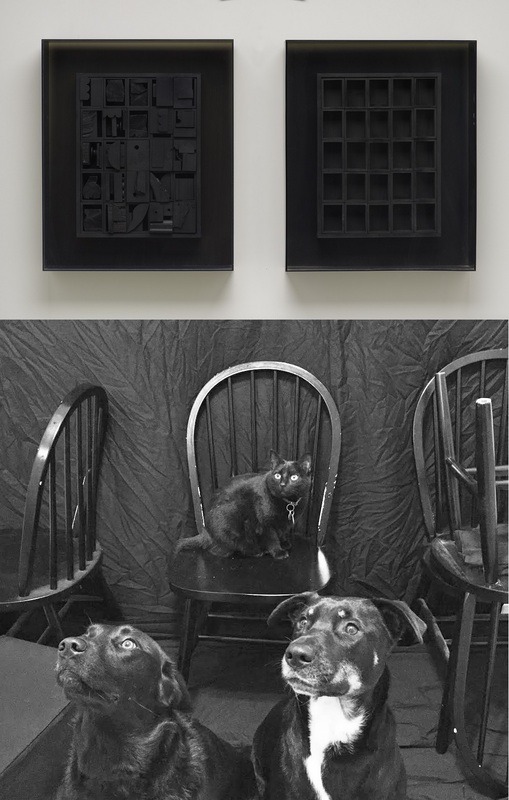 It therefore seemed fitting to take inspiration from sculptor Louise Nevelson’s monochromatic, abstract wooden forms. 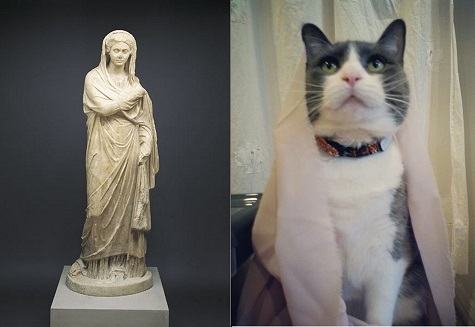 Portrait Inspiration: Figure of a woman, Roman Empire, 2nd century A.D.
Again, a cat is a very difficult model. 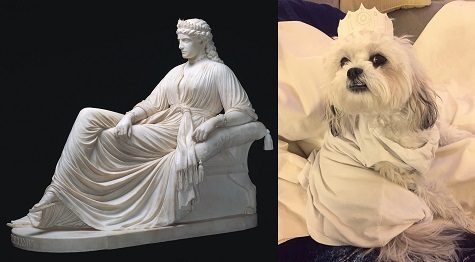 Annie wanted nothing to do with the soft drapery chosen to mimic the exquisitely carved marble drapery depicted in the ancient Roman figure of a woman. Like the noblewoman depicted, Annie typically radiates nobility and grace (until you try to cover her with fabric). I chose Semiramis because she is Mirie’s namesake! I’ve always loved this gorgeous statue and the thrilling story of the ambitious Assyrian queen it represents. Mirie is still very much a puppy, so she may not be as graceful, but she certainly has the moxie! Visit the DMA’s collection galleries, included in free general admission, to find inspiration for your pet’s high fashion and share your photos: #DressYourPetUp. Amanda Blake is Head of Family, Access, and School Experiences and Kimberly Daniell is the Manager of Communications and Public Affairs at the DMA. Friday is the most magical day of the year, well at least to some of the DMA staff and those in the doughnut business. Friday, June 6, is National Doughnut Day, and the DMA and Hypnotic Donuts teamed up to celebrate this tasty holiday in an artistic way. 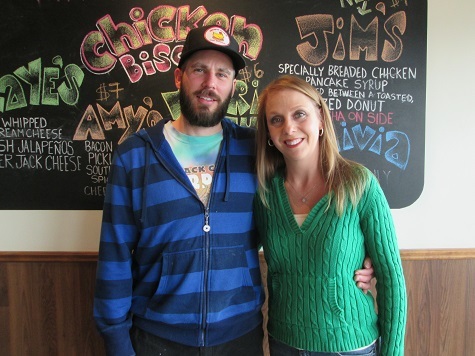 James and Amy, the owners of the North Texas doughnut store, took inspiration from the DMA’s collection and created an O’Keeffe-inspired masterpiece in frosting. We had a chance to visit with them after a gallery walk-through to spur their creative and culinary juices. What is it about the DMA’s Georgia O’Keeffe Grey Blue & Black – Pink Circle that made you think it would make a great doughnut? First, the shape was perfect; it had multiple circular dimensions. Next, we love the painting itself. It is very iconic and memorable. Tell us what ingredients went into making the O’Keeffe doughnut? We started with a base cake doughnut and then made a frosting and divided it into multiple colors and flavors. The doughnut was designed by Trevor Powers of Hypnotic Donuts. The blue is a blueberry, the pink is a light strawberry, and the green and white are both neutral. Where there any other works in the collection that screamed “perfect doughnut” to you? There are a lot of amazing pieces at the DMA. One thing we realized is there is a reason the works are at the DMA. These are true masterpieces and we found they are hard to duplicate, especially in doughnut form! But to answer the question, we also really liked The Icebergs and the warrior headdresses. How long have you been making doughnut creations? We started making doughnuts in 2010. What are you most excited about for National Doughnut Day this Friday? The people that jump on board and celebrate with us. Our life is doughnuts and it is cool to have a day that celebrates something we work with for a living. We love our community, city, and, of course, doughnuts, so we have some very special things in place to bring it all together. How can people get a peek at the Hypnotic Doughnut “DMA masterpiece”? Like all fine works of art, they truly take time. We originally had this great plan to sell the doughnut at our store and even at the DMA; however, after the time it took to make, the fact that June 6 is already going to be a busy day, and since we will not make any doughnuts the day before, the DMA doughnut will be just like at a museum: “on display only.” We will proudly display the O’Keeffe in our glass doughnut display case for all to see. At the end of the day, we will think of something special to do with it. Head to Hypnotic Donuts this Friday in East Dallas to see the O’Keeffe doughnut, and stop by the DMA to see the painting that inspired the sweet masterpiece. There must be something in the water, LITERALLY, since many of the most recognized artists of the 19th and 20th century are born under the sign of the Scorpio–whose zodiac element also happens to be water! The birthdays of Pablo Picasso, Claude Monet, Roy Lichtenstein, and Georgia O’Keefe, just to name a few, all fall between October 24 and November 23. So what is it exactly that makes these Scorpios so artistically inclined? Scorpios are considered one of the most fierce and determined zodiac symbols. Their strength and independence commands attention and they are known to possess the ability to manipulate and hypnotize. The intensity of the Scorpio spirit is often misunderstood as insincerity, but beneath their cool exterior their emotional side runs deep. In relationships, Scorpios set high expectations of themselves and expect the same commitment in return. This loyalty and passion carries into all aspects of their lives and, at times, their desire for perfection can make them obsessive, demanding, and obstinate. While these characteristics might deter others, Scorpio’s thrive on a challenge and will see a task through no matter the obstacles–often to great success. Scorpio’s live life to the extreme and banality is never an option! Using this description as a guide, it is no wonder that these savvy Scorpios developed and practiced a style all their own! Backed by their passion and determination, they explored new mediums, scientific developments, styles of representation, and ideas. Roy Lichtenstein’s Bull Heads series directly challenges and satirizes the art historical practice of Cubism. The emblem of Pablo Picasso’s Spanish roots–the bull–becomes increasingly unrecognizable as the prints progress into further simplified geometric shapes. Lichtenstein frequently consulted art historical tradition to inform and direct his works. He is largely recognized for his appropriation of the style and content of comic strips, a focus that again derived from his interest in how subject matter is not only depicted, but digested. This acuity reveals Lichtenstein’s interest in the past as a vehicle to explore new ideas and concepts. Rodin realized his passion for art at a young age, and his talent was highly regarded during his adolescent years. He faced a humiliating defeat, however, when he was declined admission to the Ecole des Beaux-Arts three consecutive times. In order to make a living, Rodin worked for 20 years as a craftsmen and ornamenter. Throughout this time, he remained determined to further develop his passions and talents, attending classes, shadowing artists, and renting small studios in order to produce large figures. Now hailed for the materiality and dignity of his works, Rodin’s Scorpio characteristics of self-determination, willfulness, and originality pushed him to overcome obstacles and become one of the most recognizable and popular sculptors of the modern era. Georgia O’Keeffe is not only hailed for her work as an artist but also for her feminist and self-reliant character. O’Keeffe unapologetically pursued her artwork and her life as she pleased. 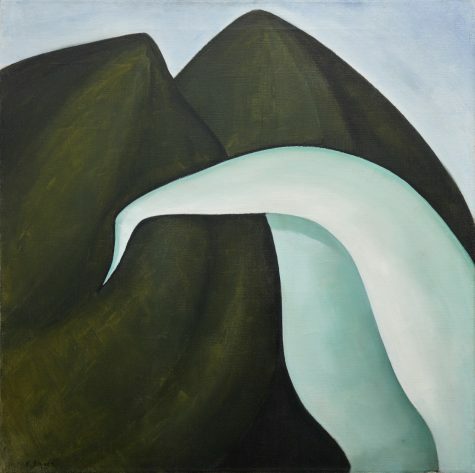 She is quoted to have said, “I have but one desire as a painter: that is to paint what I see, as I see it, in my own way, without regard for the desires or taste of the professional dealer or the professional collector.” O’Keeffe’s vision is evidenced in her abstracted, yet acutely attentive representations of singular elements, such as her iconic paintings of flowers and desert-bleached skulls. She depicted her unique worldview in paintings of both natural and urban landscapes. The work of Jim Hodges exemplifies the passion and loyalty of the Scorpio spirit. Our current exhibition, Jim Hodges: Give More Than You Take, speaks to Hodges’ commitment and generosity as an artist, a friend, a son, and a partner. Most of the works in the exhibition make direct or indirect reference to his interactions with loved ones, including Here’s where we will stay. This piece alludes to Jim’s mother and great-grandmother, who taught him how to sew and cultivated his understanding and patience for craft arts. Jim sewed each of the scarves together by hand, purposefully elongating the experience to allow time for meditation and reflection. For more splendid Scorpios, check out the work of Johannes Vermeer (October 31), Robert Mapplethorpe (November 4), Paul Signac (November 11), Claude Monet (November 14), and Rene Magritte (November 22)! And don’t forget to tune in next month for some of our favorite Sagittarius artists! Roy Lichtenstein, Bull Heads I, 1973, Dallas Museum of Art, gift of The 500, Inc.
Roy Lichtenstein, Bull Heads III, 1973, Dallas Museum of Art, gift of The 500, Inc.